Who said God came from nothing? Something uncaused = caused by nothing?? If God is uncaused = caused by nothing?? Clearly this is an equivocation on the meaning of the concept of “coming from nothing”. The word ‘LOL’ is meant to be a tip-off that I’m not trying to make a serious argument, here. I took the idea from reddit, I think, and just added the Monty Python sky-god. Only thing can cause thing? Actually, I think this one is a nice, pithy critique of the Leibnizian cosmological argument. 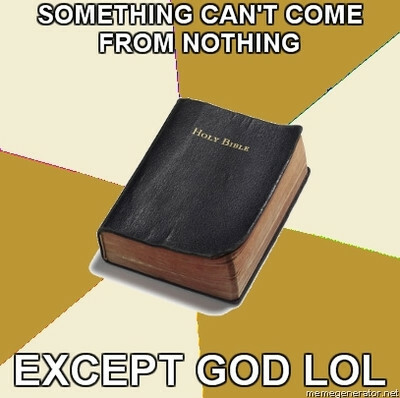 The Christian defense of this of course is that only in nature can something not come from nothing, but god is outside of nature, so he could always have existed. 2) They still have no evidence of god always existing, or existing at all for that matter. God is a self-explaining, self-existing, necessary, timeless being with no beginning and no end. Why the universe also can’t have these properties is just one of those divine mysteries, I suppose. The best I’ve ever run across on this so far is a HERE. Lawrence Krauss, a theoretical physicist, presents at the Atheist Alliance International in 2009. It’s a wonderfully entertaining history of how we know what we know about cosmology from Newtonian to quantum physics. He walks his audience through verified predictions, how we know our universe is flat, and what our universe will look like in the distant future. It’s utterly fascinating, comprehensible, and best of all…supported by evidence. His conclusion? You’ll always get something from nothing because nothing is unstable. This doesn’t seem to fit very well either. At least not on a more serious level. I think the point would be that whatever is the metaphysically primary reality is also uncaused. If there are good arguments to show that this is God, then fine. But it isn’t like the theist would have to fault alternative views for also postulating a primary reality that isn’t caused by something else. It’s just that the theist thinks those alternative metaphysical postulates fail on some other basis. The whole idea of a parody is that it presents humor through reductio ad absurdium, thus making it an unlikely tool in the philosopher’s arsenal. Additionally, it seems more creative and it gives everyone a laugh. Some of the best criticisms of theism and theistic ideas have been satires, such as Voltaire’s Candide. ‘Instability’ is a property, right? I suppose we can at least agree on that. But ‘nothingness,’ by definition, has no properties. The only way ‘nothing’ can be unstable is if it’s not really nothing, in which case we’re talking not about something from nothing, but something from something. So, is the “real nothing” impossible or does the “real nothing” entail the “nothing” that physicists speak of? @rvkevin: I don’t know… I hadn’t thought of it until I was asked, and I’m glad I was. Are you asking to point out something or do you already know the answer? Don’t know, but it follows the lines of if “real nothing” is impossible, then its meaningless when someone asks why something rather than nothing since there would have always been something, and if “real nothing” entails “nothing,” then something can come from nothing without invoking the supernatural. @rvkevin: I completely agree. If ‘nothing’ can now be thought to exist eternally and ‘pop’ universes out due to instability… there’s no reason to solve the problem of a ‘real nothing.’ The whole issue stemmed from thinking that the big bang began all matter, space, and energy and that before it… none existed. Thus perhaps if ‘real nothing’ was a figment of our imaginations, all of that time, space and energy burst forth from what was, in fact, something. Tell you what… I’ll email Dr. Krauss and ask! - Does our new understanding of the existence of dark matter/energy solve the infinite regress problem? In other words, are there any objections to having empty space containing dark matter/energy exist eternally? - If dark matter/energy does not solve the regress problem… is there still an issue of a ‘literal nothing’ existing prior to the ‘dark-matter/energy-containing nothing’? Thank you for your time and work. Your talk was absolutely fascinating and was a wonderfully entertaining and evidence-filled lesson in how we know what we know in physics and cosmology. I have pointed many individuals toward the talk since encountering it. The universe is caused, and did `come` from nothing. God is uncaused (He did not `come` from anything). From my understanding, there is a seemingly legitimate argument for an uncaused God, but not an uncaused universe: the Kalaam Cosmological Argument. Basically, the argument isn’t that there can’t be any uncaused things. Theortically, the universe is a legitimate candidate for being an uncaused entity. However, it seems as though there is proof the universe isn’t a viable candidate on a particular line of reasoning. 1. The universe appears to have a beginning (the big bang). 3. The science seems to show that the expansion of the universe won’t lead to a big crunch. 4. The concept of infinity doesn’t allow for an actual infinite, meaning if the universe was eternal in the past (which it would have to be to be uncaused), we would never have arrived at today – which we obviously have. So it appears the physical world has hurdles that can’t be logically/philisophically overcome. Therefore, something else must be posited as that which is uncaused.